Paddy was a gentleman, a man of mild manners to everyone decent. The psycho Brit Paratroopers accosted Paddy while he was delivering milk for babies to besieged residents during a Brit curfew. One of the psycho thugs stuck a gun in poor Paddy's mouth and another smashed up all the milk. Paddy McCarthy aged just 44 collapsed on the street and died of a massive heart attack. 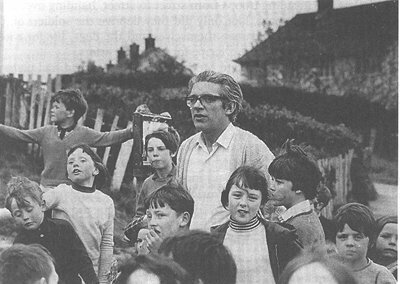 Those of us, who attended an event during the Feile in West Belfast in 2007 concerning the 1971 Internment killings when 11 people were massacred, came away from that event shocked, stunned and very angry that such an atrocity had been allowed to happen and was perpetrated by those tasked with upholding law and order. These killings have often been referred to as the forgotten massacre, but to the families left behind, they didn�t forget. For over 35 years they carried their pain and grief deep within their hearts, but their thirst for the truth to be told and for recognition and acknowledgement, is one of the reasons we are all here today. These families along with the Springhill Massacre families have had their lives devastated by state violence, cover-ups, and lies. They have seen their loved ones killed with impunity and with no proper police investigations. They themselves became targets of harassment because they dared to challenge the states version of events. Some of the families have suffered multiple traumas with the loss of other members of their family due to the conflict. No one who listened to their personal testimony during that Feile event and marvelled at their dignity and respectful memories of their loved ones could fail to be deeply impressed and supportive. These families here are the first to acknowledge that every single family who lost a member as a result of the conflict, regardless of their religion, politics, or background feel the same hurt and pain of that loss. Everyone must be remembered equally and their relatives treated equally and with respect and compassion. There must be no hierarchy of victims. On the 9th July 1972 5 people, 2 of them children and one a priest, were killed in what became known as the Springhill Massacre, several more people were injured. Local people believe that the fatal shots were fired from Barry�s Timber Yard where the British Army had observation posts. Yet like the Ballymurphy killings in 1971 and the Bloody Sunday killings in Derry in 1972, no one was ever arrested or charged in connection with the Springhill killings. The British Army version of events does not match the facts contained in the booklet �The Springhill Massacre� published in 1999 to coincide with an event during the Feile week, when witnesses spoke, many for the first time about the terrible events of that day. These families � like the Ballymurphy Families � demand the truth be told and acknowledgement be made about the innocence of their loved ones. Today we pledge our support to all these families here present and we, like them, hope to see a process emerge whereby all those affected by the conflict have the opportunity to deal with their loss in a manner that is beneficial both to them personally and also contributes to stabilising our collective future and embedding a culture of human rights and equality. I am delighted to be here today to support the families in the planting of these trees, each in memory of a loved one killed. This is a beautiful positive symbol of remembrance, of growth, of strength and of new life. It sends out a clear message that they will never be forgotten, as that would be the worst offence to their memory. TWO BRITISH ARMY PARATROOPERS who shot dead six people on Bloody Sunday are understood to have killed up to four people in the Ballymurphy Massacre, just five months earlier. Truth campaigners now say that Bloody Sunday might never have happened had the British army been brought to book for the Ballymurphy slaughter. 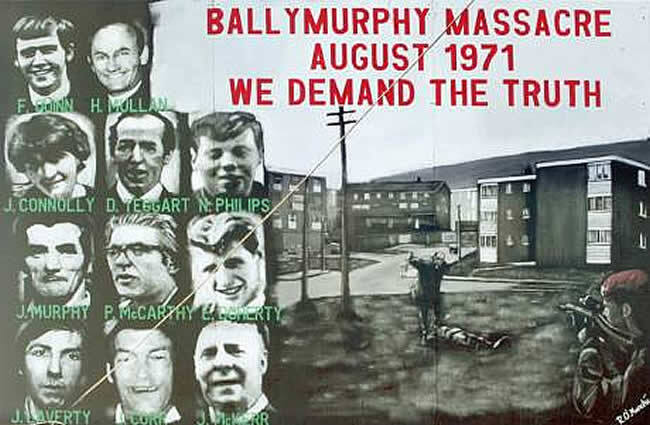 Between August 9 and 11, 1971 - the beginning of internment - 11 innocent civilians were shot dead by the British Army in the greater Ballymurphy area. Two of the dead, Frank Quinn and Fr Hugh Mullan, were killed by two snipers from the British army's 1st Para firing from the roof of the Henry Taggart Memorial Hall on the Springfield Road. The same British soldiers were also in the building when Joseph Murphy and Danny Teggart were brought there after being shot by the British Army. Instead of receiving medical treatment the men were beaten and then killed, it's claimed. The British army snipers are suspected of involvement in these deaths. No British soldier has ever faced a court in relation to the Ballymurphy Massacre. Five months later - on January 30, 1972 - the British army's Parachute Regiment was sent on to the streets of the Bogside in Derry. In a carbon-copy of what happened in Ballymurphy, although over a shorter period of time, they killed 14 unarmed civilians. Two British army snipers, identified as 'F' and 'G' in the Saville Inquiry into the slaughter, were responsible for six deaths in Derry. Truth campaigners believe they are the same British soldiers who killed up to four people in the Ballymurphy Massacre five months previously. On February 1 Andree Murphy of Relatives for Justice (RFJ), which represents the families of the Ballymurphy dead, called for an independent, international investigation into the Ballymurphy shootings. She said: "Bloody Sunday could have been prevented if the Paratroopers had been held accountable for Ballymurphy. If Ballymurphy had been investigated properly, circumstances would have prevailed which would have prevented British soldiers from shooting people with impunity in Derry." British army Lieutenant-Colonel Derek Wilford commanded 1st Para at the time. Prior to the Ballymurphy Massacre he ordered his troops to take action that would "shock and stun the population", according to documents uncovered in the British National Archive by truth campaigners. Snipers from 1st Para's elite anti-tank platoon mixed with other British army regiments on the roof of the Henry Taggart Memorial Hall overlooking Ballymurphy. Throughout August 9 they opened up on any moving target in the firing zone - killing Fr Hugh Mullan and then Frank Quinn, who had bravely rushed to the aid of the dying priest. Danny Teggart and Joseph Murphy were shot the same day. British soldiers brought them into the Henry Taggart Hall, where they were tortured, according to locals. Danny was already dead; however Joseph survived for another two weeks before passing away. The British army snipers were in the hall at the time of the torture. Danny and Joseph were beaten and had rubber bullets fired at them from point-blank range, it's claimed. It is also reported that the victims were lifted into the air with bayonets pushed deep into their bullet wounds. Andree Murphy believes that in many ways Ballymurphy was worse than Bloody Sunday. She added: "This was random, indiscriminate killing and torture. In many ways it was worse than Bloody Sunday because it lasted three days. "The British government needs to make a statement acknowledging the role of its soldiers in the Ballymurphy Massacre and the hurt and pain they caused, as well as the innocence of those shot dead. "Forty-three children were left without a parent after it ended. There needs to be an inquiry into how this was allowed to happen, it cannot stop now, it has to go further." The Ballymurphy Massacre victims were Fr Hugh Mullan (38 ), Frank Quinn (19), Noel Phillips (19), Joan Connolly (45), Danny Teggart (44), Joseph Murphy (41), Joseph Corr (43), Eddie Doherty (28 ), John Laverty (19), John McKerr (49) and Pat McCarthy (44).